The Live Mk 1 - High Performance Speaker Cable is optimised for the most accurate and time coherent signal transfer, with an exceptionally low and frequency-linear impedance. Developed in collaboration between high calibre engineers and hi-fi specialists using proprietary Total Signal Integrity Design (TSID). The result is nothing but remarkable and has been verified objectively, with high precision measurement instruments1, as well as subjectively in listening tests. A no-compromises strategy was used to achieve the best result. For this reason Live Mk 1 - High Performance Speaker Cable was designed and manufactured in Europe on precision machinery and according to exceptionally high quality standards, which is accredited by an independent certification organisation. The cable is fully customisable and banana- or spade-terminated by hand, with attention to detail, to meet the specific needs of individual customers. Live Mk 1 - High Performance Speaker Cable is made of 24 individually isolated 20 AWG conductors to obtain reference electrical characteristics and signal performance, over the whole audible frequency spectra. The use of very pure copper and large effective net gauge of 9 AWG assures very low cable resistance, rendering in close to lossless2 signal transfer and a more accurate and time coherent movements of the speaker elements. The speaker cable is engineered to have exceptionally low inductance over the whole audible frequency range and above, which is one of the key-components in eliminating high frequency signal loss (roll-off) and phase-shift related distortions. Making and presenting a cable that has two excellent electrical characteristics is easy. Unfortunately, serious speaker cable engineering is not that easy. In fact, there are not two but three fundamental electrical characteristics impacting a speaker cables performance, Resistance (R), Inductance (L) and Capacitance (C). To make things worse, they are intimately related so while optimising two of the parameters it is always on trade-off of the third. What differentiates high quality speaker cable engineering from the rest, is how small you can make that trade-off and how you minimise the effect of it. For high current applications such as speaker cables (as opposed to e.g. audio interconnects) there is a general agreement in the hi-fi industry, with very few exceptions, that capacitance is the least important of the (LCR) factors. This was also confirmed in our own testing, which gave us a clear order of priority in the speaker cable engineering process. Additionally, the 24 conductors have been placed in a refined geometry which achieves a very low capacitance, considering the exceptionally good R and L values. 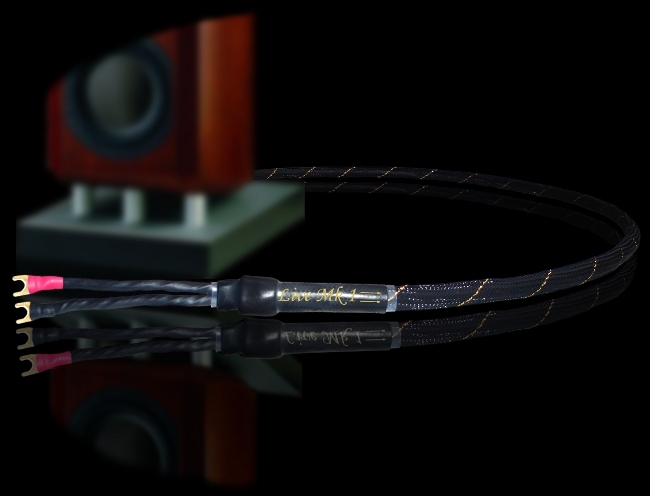 50-100% higher capacitance values are common in the hi-fi industry for “same aim” speaker cables. Finally, the special Polyethylene (PE) based conductor insulation, in combination with the refined conductor geometry, result in exceptionally low net dielectric properties. This prevents against capacitance related signal distortions and time-smeared currents. * Be aware that "loop" value is the only validated measurement method which will reveal a speaker cable's real electrical characteristics. For comparative reasons, be cautious if it doesn't say "loop" values since other methods are frequently used to obtain more favourable values. The cable construction with conductors twisted with optimum pitch and the high-specification manufacturing process provides an outstanding protection against external electromagnetic interference (EMI/RFI). Additionally, the cable is both shielded and has a separate ground (earth) drain-wire. This can be made available for termination on the amplifier side (and if desirable also on speaker side), upon customer request3. Live Mk 1 - High Performance Speaker Cable is terminated with low mass (thin wall) precision connects for rigid connection and optimal signal transfer. Only the best materials are used, tellurium respective pure copper, for the banana and the spade with a 24k gold extrusion on the surface for highest performance, since gold is the only high conductive metal with 100% corrosion-resistance. 3 This option is available only on request since it potentially could degenerate the high performance of this speaker cable if not properly connected or used on equipment with insufficient ground (earth) drain. "Immediate response when playing the first section: Mediterranean Sundance Rio Ancho…., was a wow - these cables are really good…"